Observation - Butcher's-broom - UK and Ireland. Description: Small shrub with leaf-like cladodes (flattened stems); the leaves are reduced to small scales. 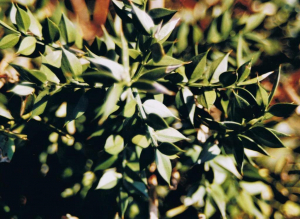 Small shrub with leaf-like cladodes (flattened stems); the leaves are reduced to small scales.